I have two cards to share with you tonight - my card for the Split Coast Featured Stamper challenge and a Father's Day card using the technique of paper piecing that was a challenge on Sharon's No Time to Stamp blog on Friday. 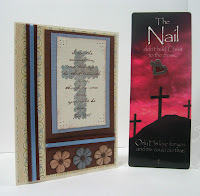 First up is my sympathy card which is a Case (copy and share with everyone) of a card made by Laura (Scrapnextras on SCS). You can see her card here. 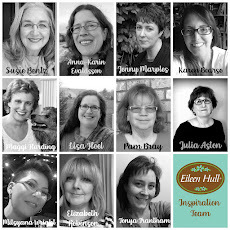 She has a wonderful gallery on Split coast and a wonderful blog that you should check out! When you copy a featured stamper you are supposed to change at least 2 things on your card. 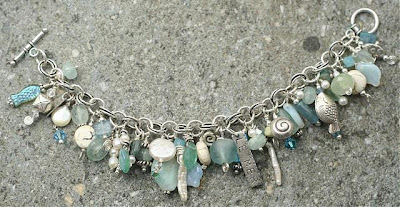 I used different stamps and a different edge punch and I used all soft sky instead of adding white CS. I used twill instead of ribbon and did alternating black and white dots for doodling. I put some Diamond Glaze over the blossoms to add a little shine but I don't think you can see it in the photo. I put a sympathy sentiment inside my card - but this could also be a card for saying you are sorry for hurting someone's feelings or for having a disagreement with someone. 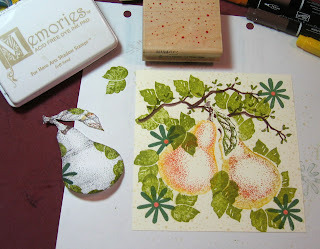 My second card was made for Sharon's Friday challenge on her blog - No Time to Stamp. 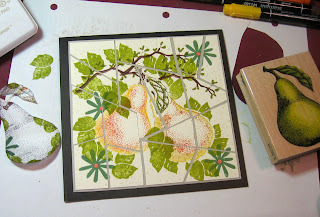 The challenge was to use paper piecing on your card. The tie on this cute dog is paper pieced. I stamped the dog image on the vanilla card stock. 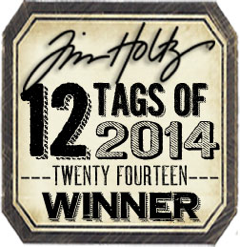 Then I stamped it again on a piece of blue designer paper (same as the background panel). Then I cut out just the tie piece from the stamping on the blue and attached it over the tie stamped on the vanilla. I colored in my dog with my Prismacolor markers. 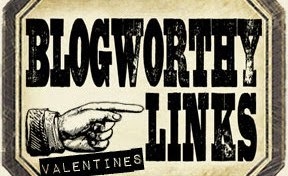 The dog and sentiment are up on dimensionals. The card is small - 4.5 x 4.5 size. I put it in a regular size envelope when I mail it though so it only costs the regular first class postage rate. If you put it in a small envelope it costs more because it is off-size. This is such a great techique - you should try it if you haven't already. It works really great on the Chef stamp by Stampin Up - and on all the headless figures (!) of My Favorite Things stamps - and the Hanna's dresses, etc, etc! Look on the right hand column of my blog under "Look Here to Find" and scroll down to Paper Piecing if you click on it - you'll see my other sample of this technique. I want to thank you for stopping by - come back tomorrow and see what else I've been working on! Hope everyone is having a good day today! We are supposed to be getting some rain but so far it's just cloudy and there is talk of a little snow coming in the next few days - hopefully north and west of here!! I have two cards to share with you today - the one above is for today's Split Coast Challenge to 'Just Spray It' - to use some sort of spray (water, glimmer mist, airbrush, hairspray - whatever!) on your card. My second card which will be further down here - is the retirement card I made for my sister to give to her brother-in-law. Finally finished it after talking about it here for 2 days! For my challenge card - I inked my stamps with Vintage Photo Distress Ink by Ranger and then misted the stamps with water in a spray bottle lightly before stamping them (took several tries to get it not too wet!!!) I used the Paisley background stamp, stamping it on white Papertrey Card Stock and a hydrangea stamp from Anna Griffin that I stamped on watercolor paper. I colored in a few of the petals with my Stampin Up marker just for a little color accent. I pierced several edges - put ribbon around the Brown Bazzill panel and distressed the watercolor edges. The sentiment words are by Papertrey from the Paper Tray set. Misting a stamp with water is a fun technique - it can give you many different looks depending on how much you mist. My sister asked me to make a card for her brother-in-law as he is retiring in May. She said he likes car racing and they are moving to Arizona (from MA) after they retire. So this is what I came up with. I got the Arizona post card image from a book with a CD of images called 'Old Time Travel Posters and Luggage Labels' from Dover Publications They also sell them at Barnes & Noble and Borders Books. First I made clouds in the sky using a home made template that I cut using scalloped scissors and sponged along the edges with soft sky. I've included a picture below showing my template and sample clouds. 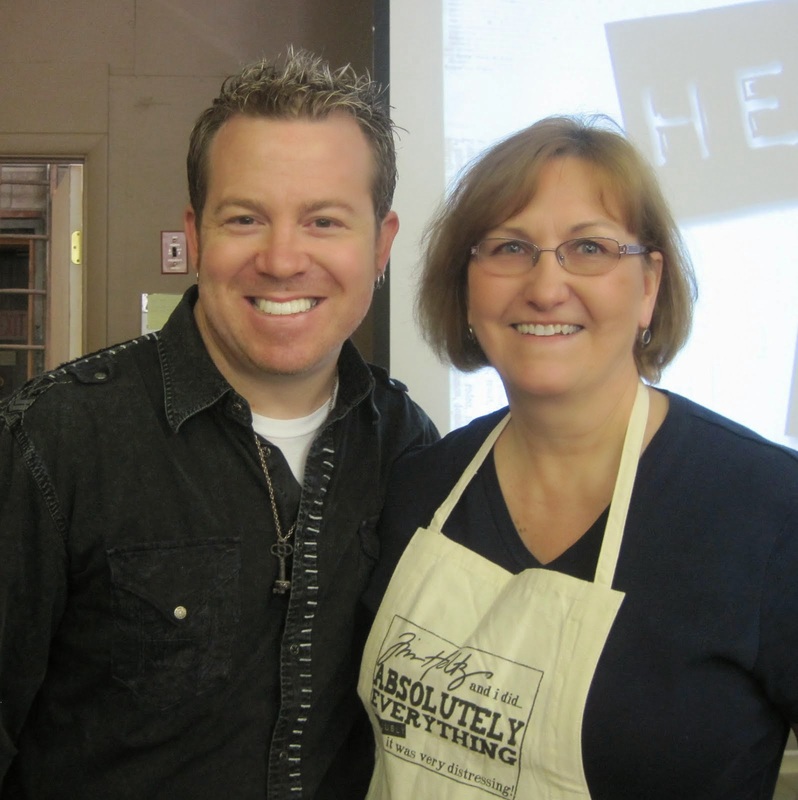 I learned this from Mothermark (Cindy) on Split Coast. 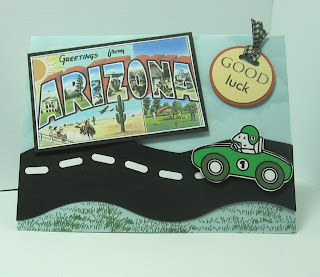 I made the road with a piece of black card stock that I cut with my curvy paper cutter from Creative Memories and added the 'lines' with punches from the horizontal slot punch from Stampin Up. The cartoon race car is a clip art from Word. I stamped a little grass below the 'street'. All the cut outs are up on dimensionals. Inside you can see that I stamped clouds all over. The racing flags are a sticker from a set I picked up at Michaels. The sentiments are listed in the supplies list below. I think Dave will get a kick out of this card - don't you??! Stamps: sentiment: Papertrey Ink - Paper Tray, grass - Sutter Enterprises Inside Sentiments: Happy Retirement - American Art Stamp, Always take the scenic route - Inky Antics, and Dave was stamped with Karen Fisher alphabet Snap Stamps. Here is how I make my clouds. I made a template with a piece of cardstock that I just cut in different curves with my scalloped edge decorative scissors. You hold the template starting at the base of where you want the sky - and just sponge sections just a little over the edges - then keep moving the template from left to right and then move up intil you have your full sky. I find that Soft Sky Ink is a perfect color for clouds. Give it a try - they really come out neat! Thanks for stopping in tonight - I'd love if you'd leave a comment for me about what you think of my cards - have a wonderful night! Kent and I are going to a play tomorrow night - so I probably won't be posting again until Saturday - so see you then! You may have noticed that I wasn't here yesterday??? I was dutifully sitting at my diningroom table pulling my hair out doing my taxes. I 'think' I'm done with the Federal but still need to do the State one and then review the Federal one more time. The forms are so absolutely rediculous aren't they??? - they drive me crazy. There has to be a more straightforward way for these to be done! So - by hook or by crook - I was going to stamp today. 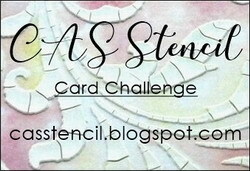 And today is the Sketch challenge over on Split Coast which I always do. 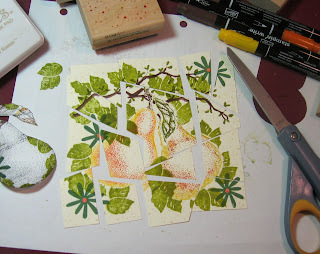 Another thing I have been wanting to do is try out one of the terrific tutorials Michelle Zindorf does on her blog. She is a wonderful artist and shows how she creates her beautiful cards - step by step - so we all can recreate them ourselves ! Since the stamped panel on this sketch is only 1.5 inches wide I knew I would only be making a small sample of Michelles technique so it was less intimidating than trying to fill the whole panel on my first attempt! 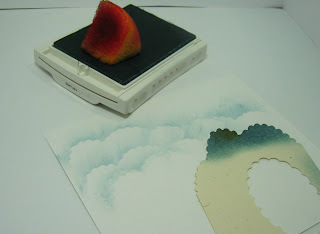 Here is Michelle's tutorial for her Sunset Wheat card. I used my cat tails stamp from Stamps by Judith which I stamped using river rock and versamark inks and embossed in clear embossing powder. Then I sponged all the colors on according to Michelle's directions. I sponged rather than brayering as I cannot seem to get good coverage over embossing the way she does with her brayering. I masked for the moon and overstamped the wheat in black ink at the end. See her tutorial for full instructions on all these techniques. I stamped a portion of the Cheesecloth backgrounder stamp by Cornish Heritage Farms on the back panel using Espresso ink by Adirondack. The sentiment and circle are by Verve Visual. The cat tails panel is up on dimensionals. I am pleased with how my first attempt came out - I can't wait to have some more time to try out another of her tutorials on a full size card! Thanks so much for dropping by - for those of you following such things - I have almost finished the retirement card for my sister's brother-in-law that I mentioned on Monday but I'm not totally happy with it yet - I'll post it as soon as I am! First - I just need to reflect on today being Good Friday and remember the great sacrifice that was made in Christian history for us. I served as a layreader at church this evening and it was a very moving service with the altar stripped and just the stark cross there. It was a good time to stop and reflect. And we have the happy Easter Morning to look forward to! 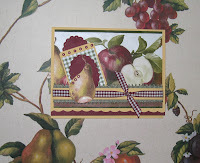 Has everyone cleaned their homes and bought all the food supplies if you are hosting dinner? We are going to my niece, Katie's, home this year so I just need to make scalloped potatoes which I will be putting together tomorrow! I'm going to bring the supplies to make these two cards with my sister, Marcia, and nieces, Christie and Katie, on Easter - we have fun after dinner on holidays making cards together - and everyone can always use Thank You cards! 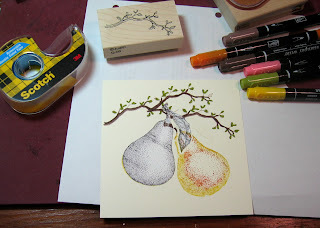 Today's Limited Supplies challenge on Split Coast was to make 2 cards using the same stamps and DP's but different layouts, tools and/or embellishments. I just got a great book called Card Makers Sketch Book that has over 200 card designs in it with colorful samples shown for each sketch. I have found it to be a great help in designing cards. I used this book for the two sketches on these cards. 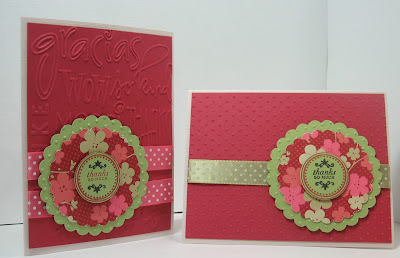 For the challenge - I used two different sketches, different Cuttlebug folders and different color ribbons on my cards. I held one card horizontal and one vertical and used different ink on the sentiment. I was surprised and happy to see that the Stampin Up Ruby Red Card Stock matches the Papertrey Berry Sorbet ribbon and the Papertrey Spring Moss ribbon goes well with the SU Certainly Celery CS. Which one do you like best??? Thanks for spending some time with me here tonight - be sure to check out the Easter Carrots on the posting below! I wanted to make some treats for Easter dinner at my niece's home for her guests and I found this fun carrot pattern on SCS and thought they would look so CUTE on the dinner table. I wanted to make the ribbon that ties the top shut look sort of like a carrot top and so tried shredding it and I thought it came out pretty good! This is also my project for the Ways To Use it Challenge on SCS - to use a tag. First I cut out and stamped my carrot pattern using a little flowers bg stamp (see supplies list below). Next I scored the lines indicated with a ruler and my scoring piece from my Scor-Pal. You can use a Scor-Pal but the lines are kind of irregular in their placement so I found it was easier using a ruler. I glued the edge using Scotch Quick Dry adhesive that I bought at Michaels. Then I punched a slot on each of the larger tabs - one on front and one on back for the ribboon to go through. The ribbon is 8" of 1/2" green grosgrain. I put it through the slot punches with even pieces on each side - then I tied it in a double knot. Next I cut the bound edges off each side - just a thin sliver so it releases the cross threads. You want to cut up as far as you want to shred. Then take a slightly thick sewing needle and stick it in the cross threads and pull down - you need to hold onto the ribbon above where you are pulling as it takes some tugging - just keep riping out the cross threads until you are up as far as you want - in other words - until you have the length of fringe that you are looking for - if you want more, just cut off more of the bound edge. And here is the curly top to the carrot! 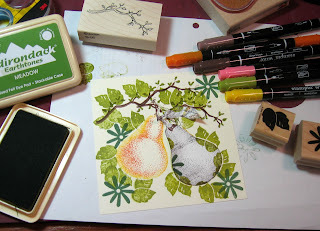 The final step was to stamp the cute rabbit from Lockhart Stamps, (it's on sale right now so check it out! ), color her in with my Prismacolor markers and cut the petite ovals with my Nestability dies using my Cuttlebug. I attached an eyelet using my Cropadial and tied it around the ribbon using Baker's string from Martha Stewart that I got at Michaels. Let me know if you try this ribbon shredding on your project and link it here in a comment - I'd love to see what you make! I've used this ribbon technique on cards too - check out my 'How Frazzled Are You' card in an earlier post. It just adds a fun demension to what ever you put it on. Thanks for stopping by today - I'd love to hear what you think about my first ever tutorial - you can click on 'comment' below and let me know! I feel like it's a Saturday because I'm on vacation and I've been home all day puttering around! I needed to create a masculine birthday card for our next card stamping workshop that 2 friends and I run at our church so I used today's sketch challenge as well as Monday's Try a New Technique challenge over at SCS to help me design it. I chose darker colors for my panels and card since it's for a guy. I had this fun cobblestone DP that I thought would look like a road or a wall around my antique truck. I purchased it at Michaels. 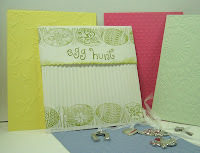 I rubbed creamy caramel on the cuttlebug mesh folder before embossing it on the Kraft panel. This was the technique challenge - negative cuttlebug and the instructions from SCS are listed below. The edges of the car and sentiment are sponged and the car edges are distressed as well. I just used little pieces for the green around my panel - one on top and one on bottom rather than adding yet another layer to this card!! Both of my stamps are from Stampin Up - Classic Pickups and It's Your Birthday sets. 1. Take your CB folder and open it up so the negative side is facing down on your table. This is the side where the CB logo is. 2. Using whatever color ink, and whatever type of ink, ink up the negative side using either a sponge, brayer or the ink pad itself if you are using spots or the petal chalk inks. 3. Lay your cardstock over your inked side, close the folder and run it through your CB. Make sure to wash your folder ASAP, to avoid any staining from the ink. 4. 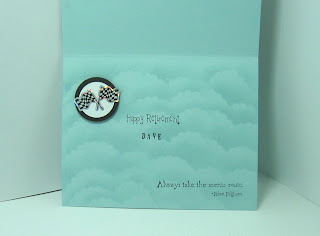 Now you have an inked and embossed image to add that extra touch to your card!! Remember, if you are using chalk or pigment inks, you will want to wait for them to dry before putting your panel on your card. You can also use your heat gun to help them dry. Hope you have a great rest of your night! I'm off to bed soon - I need to catch up on some sleep if at all possible! I'm on vacation this week so I'm having fun getting in more stamping time and may even be able to clean up my Stamping Room!! DH, Kent, and I just spent 3 days up in Vermont visiting his brother and sister-in-law. They have a beautiful post and beam house up there. We went snowshoeing twice - right from their front door into the hilly woods around their home. It was sunny and bright - and not too cold - perfect weather to be out there. Here are a few pics of our outing! Chad & Kent surveying the land - Kent, Me and Blue - Carol giving Blue a treat. Now on to my posting today! 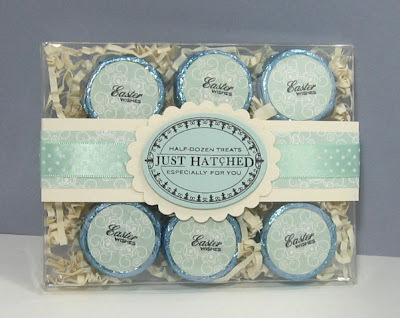 I made this cute Easter Treat Package using the PapertreyInk set released in February 'Just Hatched'. 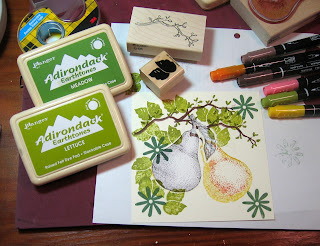 The stamps, DP's and ribbon are all from PapertreyInk. I had submitted this for their March Guest Star Stamper competition. I got the clear box from Clear Bags but Papertrey also sells them. I used shredded Easter paper inside that I got from Michaels. I love how it matched the Very Vanilla card stock. I cut the ovals with my Nestabilities. The candies are small York Peppermint Patties and I punched & stamped the circles that I put on them. It took a while to get them all in there with the shredded paper evenly distributed around them! The CS papers are Very Vanilla and Soft Sky. I thought this would be a nice gift to bring to a dinner host on Easter Day or to bring someone in a nursing home when you visit etc. A small token that looks nice and festive! Note I got some inquiries about the size of the container: the clear box is 6" x 4.5" x 1/2" and also fits 4 cards and 4 envelopes if you wanted to package up some cards! They come with little clear bands )like elastics) to loop around the corners to hold the box closed too - what fun! 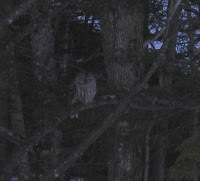 Here are a few more pics of our trip to VT.
Bear claw marks on a tree. The owl in their yard A Moose Statue outside a shop! Thanks for spending part of your day with me here - I'll be back later with some cards!